Pictures of teams with names of players towards the end of the article. For photograph of 1920’s team click here. My association with Benfleet Football Club started back in 1961 having moved into Benfleet from Potters Bar, Middlesex in 1960, previously I had played for Potters Bar F.C. 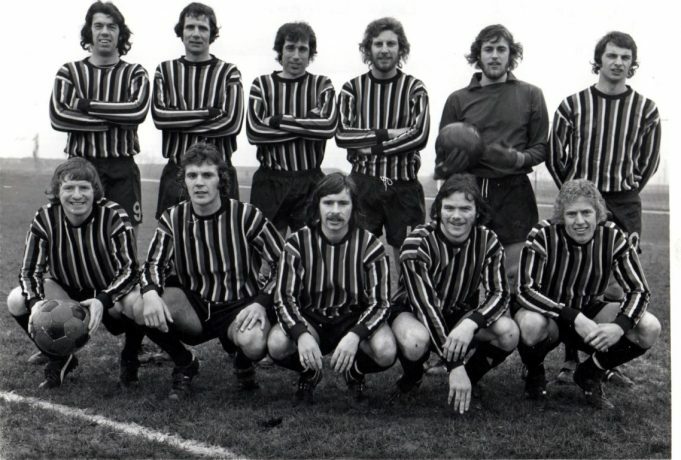 I joined Benfleet United, as it was then called, for what turned out to be a close commitment for twenty years until 1981 when I had to stand down as my work moved me to Kenya. The Benfleet Football Club is long established as there are photographs dated as early as 1922. They played at the Recreation Ground in Benfleet behind the shops in the High Street. This was before the large area reaching down to the railway line and across to the railway station was recovered from being an army campsite. It was later developed into an area supporting several football pitches with the largest being at the end of Brook Road opposite a new pavilion. We had the privileged use of that pitch. Prior to this development there were just two pitches. There was no changing room building so the players changed in the toilet block in the “Gents” situated just in from the entrance to the recreation ground from the High Street with “Burdetts” the chemist (who generously donated medical items to the club) on the corner. It was – to say the least – awful by today’s standards! An event that just about showed how flexible things were in those playing days was when on a freezing cold day our first team centre half – a Johnny Nunn whose father had a butchers shop in the main road – managed to talk the referee into allowing him to play with his overcoat on as he had a bad cold! It was a remarkable sight. At that time we played in Newcastle United’s colours with the black & white striped shirts and black shorts and actually managed to get a free – second hand – set from Newcastle United! I became secretary of the club (nobody else wanted it!) and this started a progression onto expansion and development. Benfleet United was rapidly becoming an elderly team and losing the young players of the village to a team based in Thundersley called Parkfields Athletic so we approached them to discuss a merger to pool and develop our joint resources. Only two members of Benfleet United met with the full committee of Parkfields at a Wooden Changing Rooms at Common Lane, Thundersley and we negotiated a settlement to create a club to be named Benfleet Rangers. A merger of active management and the selection of team managers for four teams was agreed with the use of the Benfleet pitch for the first team and reserves with the 3rd and 4th teams playing at the Common Lane pitch in Thundersley. The clubs colours to be an all-blue strip when existing colours were exhausted! This merger introduced two Parkfields committee members who were to contribute considerably to the foundation of the club. They were Don Gray and Keith Barham. I personally remember the Common Lane pitch well as in the Third Team I broke my ankle there in a tackle in the very thick mud! With no stretcher available one of the changing room doors was taken off and suitably utilised to get me off the pitch, load me into a car, and get me to Southend Hospital! The three people to emerge as the driving force of the new club, a management team that stayed in place for some twenty years was Don Gray for overall team/player management and player procurement, Keith Barham who as treasurer kept a very tight rein on finance and myself as Secretary carrying out administration, secretarial work, planning and all negotiations relating to the development of the club in order to achieve which becoming a member of the Castle Point Sports Council and committee member of the leagues. We were then informed that the Benfleet Amateurs Football Club were breaking up so without question we took on their commitments, players and pitch facilities, so making Benfleet Rangers a six team club with a side in every division of the Southend and District League. Subsequently, we added the local youth teams! On Saturday evening, every weekend, I would obtain a report from each of the six team managers and write (by hand) a report on every teams performance and get it off to the Southend newspapers for publication later in the week. I wonder if anyone ever saved them? 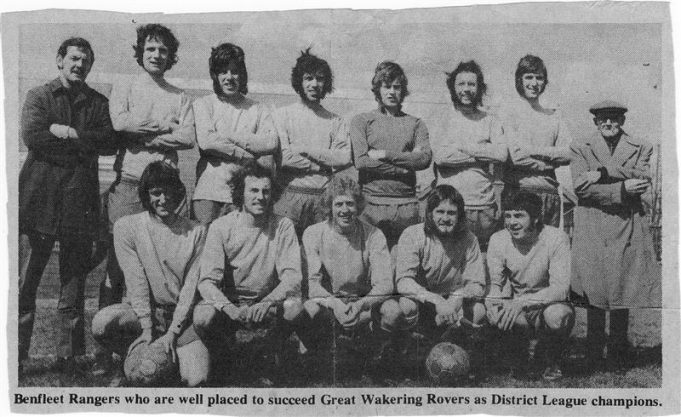 With six teams we met every Monday evening for selection purposes – with all team managers and the management committee mainly in “The Anchor” in Benfleet so we were selecting some 80 plus players with reserves every week. Very few had phones so as Secretary I would write and post or deliver postcards to everyone detailing match, kick off and meeting place. If a match was called off I would need to resort to phoning round all the local pubs and leave messages for the players concerned. Normally, all the away teams would meet at the car park of the pub at Tarpots Corner giving the opportunity to ensure all teams were up to scratch and even at times stopping young men – strangers – asking them if they wanted a game – we got some good players like that! In the meantime Benfleet Recreation Ground had developed considerably. All the rough ground remaining from the army camp had been developed into four pitches with a brand new changing pavilion at the end of Brook Road opposite the largest pitch assigned to Benfleet Rangers. 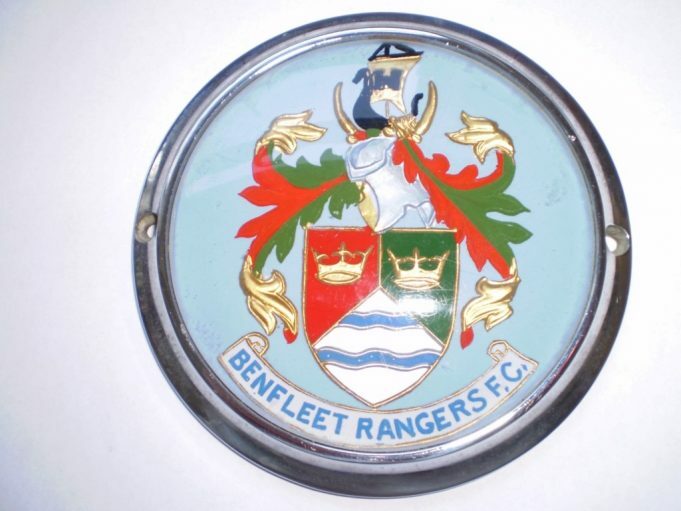 On the subject of the name of the club as Benfleet Rangers, We sought and won permission from Castle Point Council to use the official Castle Point coat of arms as the club badge. This was – and probably still is –a special honour. Accordingly, we had club ties printed and car badges made (I still have mine). With a determination driving us towards seeking senior football status we initially sought permission to build a clubhouse at the end of Brook Road strongly objected to by the local residents. We produced the plans and arguments for the building but of no avail as the residents had a very good case. However this led us to better things as we then went to the Council for their help and they offered us Woodside at a peppercorn rent for us to develop a pitch and build a clubhouse. During that period and even when we started on the clubhouse we desperately needed to build up cash and to do this we held Buffet Dances in Joe Pike’s large café on the Manor Trading Estate, Entertainment including “Stag Nights” with buffet in the Hollywood Restaurant in Shipwrights Drive (for a time I lived opposite) and Dinner Dances at Runnymede Hall. We did “Jumble Sales” driving all-round the village in a lorry and knocking on doors to get any object people would part with. To raise money we arranged a match against a “Spurs Eleven” to take place in the Southend Greyhound Racing Stadium. To advertise it we got hold of a large container, covered it with plain paper, and painted details of the match upon it. Attached balloons all over it and entered the annual Southend Carnival parade along the sea front with our collecting boxes to get more cash! 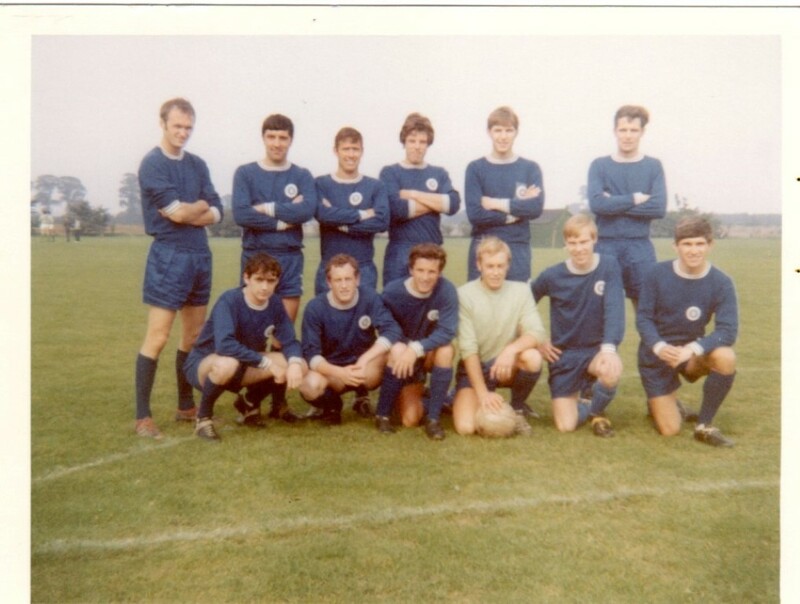 In the meantime we did well in all the divisions of the Southend & District League notably winning the Essex Junior Cup 1967/68 against Rowhedge and the League Championship 1972. The Southend Charity Shield was won 1973/4. 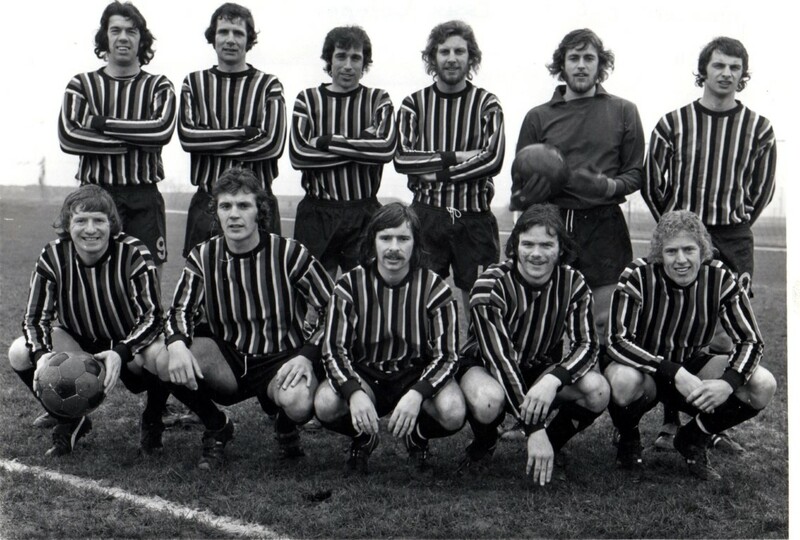 Notably our sixth team won the Division Six league cup in 1969 – scoring a single goal against Stambridge. The official report said that we only got into their half once and scored. I was playing as part of our ten man defence past it aged 37! I have no records of other trophies as I handed over every document I had when I left the club to go and work in Kenya in 1981. We sought grants everywhere and finally came up with Greene King being prepared to subscribe to the building and bar and significant financial help from our Club Chairman Ted Francis. We designed the club house and with our membership including many skilled craftsmen and keen committed helpers/ labourers we built the place! The present Chairman of the Club, Dave Dady, was one of these who besides playing made a physical contribution to these works. Sometimes building materials, fixtures and fittings had a habit of appearing from out of space! With the field being rough and on quite a slope we got a specialist contractor in who first of all scraped all the top surface (topsoil) over to one side, levelled the pitch and put the topsoil back! It was then mechanically seeded and we just had to wait for the emergence of that green stuff – what a relief it was when it all came through! In this period we won the Championship of the Southend & District League and changed our name to just Benfleet Football Club – Benfleet F.C. We applied for, and obtained admission into the Essex Olympian League so we had our first and second teams playing in that league. We were very progressive and became the first team in that league to provide all of our Olympian League players with trainer tops (complete with badge) for the “warm up” before matches. It was great to see the lads trotting out and said by opponents to give us a goal start psychologically! I must make special mention of the commitment made by our wives and families during the developing years for we were always at meetings, training and matches and they followed our commitment in the background washing the kit – by hand and on washing lines – producing and serving food from home and in the kitchen when the clubhouse was operational. Our biggest disappointment was failing to get into the Essex Senior League who turned us down because our pitch was too far away from the changing rooms (health & safety dangerous for the referee) and the lack of dugouts we so easily could have provided! This document only takes my knowledge of the club into account up to 1981 so does not refer to subsequent events/achievements.. It is wonderful to see how well the club has developed and expanded to include Ladies and a large number of Youth Teams and that one of the originals who physically helped build the clubhouse – Dave Dady – is now Chairman. The photograph below shows an ardent supporter named Jim Rogers who turned up to support whatever the weather. He was in his late seventies, lived near Tarpots and rode round on a very upright, tall bike with a garden fork lashed to the crossbar (he did occasional gardening) always in overcoat and cap as in picture. He would “run the line” if given the, opportunity, castigate opponents and on one occasion kick a referees car for cancelling a game. He also had a reputation behind him from his past of various acts against officials like setting fire to or throwing their clothes into a pond. We understood that in his youth he was a regular in front of the League Disciplinary Committee! So there it is – a resume from my view of twenty years committed to Benfleet F.C. with Thelma my wife supporting me albeit at the great expense of all the hours I put in missing out a “normal life”. Our sons Nigel & Clive both played – Nigel as regular first team forward (Striker these days) scoring a lot of goals whilst Clive was a regular defender in the Reserves occasioning into the first team. So for all that time it was a household heavily committed to Benfleet F.C. Essex Junior cup Winners !967/8. Adam Graham, Boz Bouchereau, Alan Farrow, Alan Whiting, Keith Way, Terry Sawford, Terry Hebburn, Charlie Poole, Keith Newman, Dave Earey, Steve Ballard, Bernard Tracey. Essex Junior Cup Winners, my brother Eugene Bouchereau, nickname Boz, is second from left and Alan Farrow was in my class at school and is still good friends with my brother. I remember Brian Baker, Nigel and Clive who I played with on many occasions. I started in the youth team and played on and off for about 6 years. Remember old Jim Rodgers, what a character he was. Had some good times playing and in the clubhouse for a drink afterwards.